WATCH THE SUNSET OVER APALACHICOLA BAY! Everyday discounts: 10% off for 60+ seniors, active or retired military, or repeat renters. I.D. required, offers cannot be combined. If a swimming pool is important for your vacation, ask for dimensions. Many SGI homes have really tiny swimming pools. See the schematic included with pictures for the exact manufacturer's measurements of our pool. Pool can be heated for additional charge. Each bedroom is a master suite featuring a private bathroom and a majestic view of the bay and marshes (paradise for bird watchers). Glass doors slide open from each room onto a wrap-around deck with a screened-in porch. 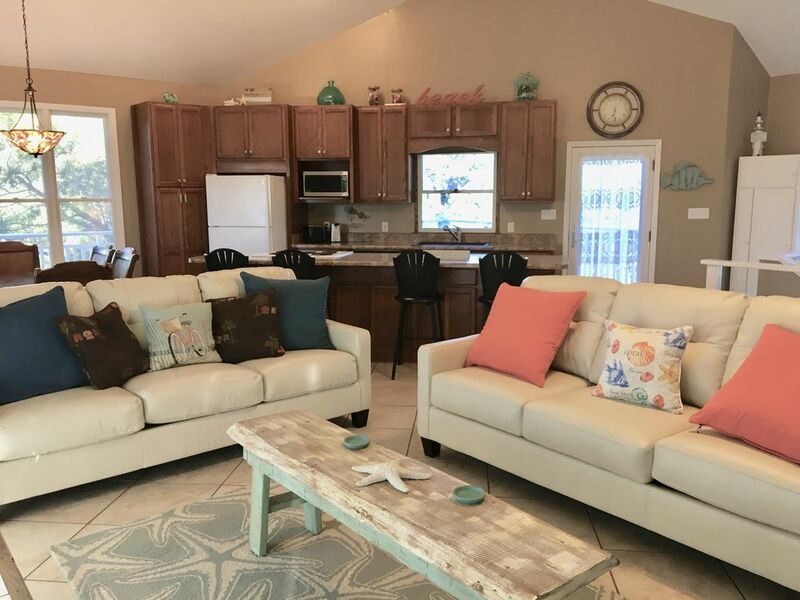 There are two separate living areas, a well-equipped kitchen, ceramic tile, and a beautifully landscaped PRIVATE SCREENED POOL overlooking the marshes. Three blocks away (on quiet roads or trails) to the beach, dunes, and tennis courts. This beautiful bay view house is situated at the end of a cul-de-sac road in the Plantation, a famous, gated community that has preserved the natural beauty of the barrier island. The Plantation has extensive bike trails, two community pools, 3 different tennis courts, and a rock jetty (The Cut) famous for excellent fishing. After a day of outdoor activities, the private screened pool overlooking the marshes will entice you to relax and enjoy the great view and the local bird community. The house also has an enclosed outdoor shower and a fish cleaning sink. This house has two separate living room areas, each with a flat-panel cable TV, that can easily accommodate two families. The wrap-around deck and the screened porch provide an unobstructed view. Two large decks facing the bay are furnished with Adirondack chairs and a hammock, a perfect place to relax and enjoy the great view of the bay and marshes. Beds include one king, one queen, one queen pull-out sofa, and one bunk bed consisting of a lower-queen and single-upper. We are a busy family that love our time away on vacation. We have three children that keep our schedules full and it is almost a necessity to get away and enjoy our time together. We visited St. George Island in 2007 with our family. We all had a great time fishing, biking, and exploring the island. Our kids have always loved the water and being at the ocean. From the first time we saw A Bay to Remember, we knew it would be a great home away from home to raise a family and build a lot of memories. If you like elbow room and privacy, you will love 'A Bay to Remember.' ABTR is on a one-acre lot with all adjacent lots currently undeveloped. ABTR has 100% tile floors, which are vastly superior to carpet with an island climate and pet rentals. Pictures do not do justice to the views toward Apalachicola Bay. We often find ourselves just looking out the windows. . The house is 3 blocks from the Gulf of Mexico and St. George Island has 20 continuous miles of beach. The Plantation also offers beach parking at the Resort Village parking lot one block away. View across beautiful marshes to the Apalachicola Bay. Two units --up and downstairs. Jenn-air electric range and oven. This is a pantry for personal food items. Well equipped with small appliances, cookware, dishes, glassware, and silverware. Dining room table has six chairs. 1-2 other chairs can be added. 5 flat panel HD TV's. Internet-based cable service with extra movie and music channels. (5) All modern flat-panel TV's. TV service has 19 movie channels. Living room has a Blu-ray player with WiFi. A number of hardback and paperback books are available. Large selection of board games. Lots of DVD movies on hand - over 50 at last count. (2) Sliding door access from all bedrooms and living areas. Decks surround both floors of the house. The Plantation has three tennis courts for use by guests. The nearest about two blocks away. Two golf courses are about 30 and 35 miles away. Probably 95% of homes on the island are on stilts. Only stilt homes with elevators are wheelchair accessible. Screened on a one-acre lot with many trees and shrubs. One of the most private pools on the island. Heated pool available for an additional cost. Large swimming pool located at Plantation Club house and at the Resort Village. PRIVATE SCREENED POOL 5-Cable flat-panel TVs, 2-DVD (one Blu-ray with WiFi), CD/Tape Player, Well-equipped Kitchen, Enclosed Outdoor Shower, Fish Cleaning Sink, Park-style Charcoal Grill, unlimited high-speed internet access (bring your LapTop), Non-smoking. A Bay to Remember is truly unforgettable! It is in a private gated community but still not far from the center of the island where the restaurants and stores are. You feel as if you are alone in your own private paradise as you can only see a few houses through the trees, a distance away. The bay views are mesmerizing and can be enjoyed from every room. The birds sing their serenade and call you out to sit on the porch. But then the big decision is which porch? The top floor screened in area? The top floor hammock? The top floor porch facing south or the one facing north with the incredibly comfortable new dual glider. And then there is the first level wide porch as well. The screened in pool area also invites you in, with its new furniture and very large pool, which can be heated. Not many on the island offer heat (all for an extra fee) and I’m guessing this pool is among the largest on the island. There are just so many choices for enjoying the outdoors on this property. The inside is just as wonderful. It is tastefully decorated. The furniture is very comfortable and of good quality. Everything is fresh and clean and you immediately feel right at home. The open floor plan on the top level is great for gatherings. And the first level has its own (second) family room - a great option for the kids or multiple families. The kitchen is very well equipped, the best we’ve had in decades of renting beach houses. We’ve previously stayed in the middle of the island (Gulf Beaches) and were afraid we would miss that area. It took about two minutes for us to fall in love with everything about this house and its gorgeous, peaceful surroundings, and never want to leave. The amenities that The Plantation has to offer are a bonus. The owner has been very pleasant to work with and promptly responds to any communication. We highly recommend this house and look forward to many more stays here in the future. We feel very fortunate to have discovered this gem. There is nothing that makes me happier than to read the kind words of a guest that experiences the same feelings as my family does, every time we pull into the driveway of our home! Thanks for taking the time to put your feelings into words for future guests to read...hearing from an existing guest is an important part of the due diligence performed in making a decision on where to spend your time on the island. Thanks again, we work hard to insure every guest that stays at our home has the exact feeling as you, that is the standard we thrive for! The house was spacious and had nice views of the bay. It was adequate for our family of five and within walking distance to the beautiful beach on the other side. There were tvs & bathrooms in every bedroom & plenty of cookware. However, there were no additional cooking/kitchen supplies (ie. salt, pepper, oil and only one roll of paper towels). So be sure to bring your own. The entire house was in ok shape but in need of updating. The screens would fall off every time we tried to open them so we just used the sliding glass doors. Overall it was a decent house in a very serene location. We had a relaxing time. So glad to hear you enjoyed your time at our home and most important, a relaxing time...so easy to relax on our wonderful decks overlooking the beautiful bay! I’m sure you can appreciate we can’t supply some of those convenient cooking supplies as that could create a sanitary issue. Thanks so much for your feedback and for choosing our home! The house was very nice, the kitchen was very well stocked. My problem was it was not clean. As soon as I walked up the steps I could see the oil that didn’t get washed off the counter top. The hand rail and back of the kitchen chairs were so sticky it took me 3 times finally get the gunk off. All 3 bathrooms had mold in the shower and my daughters bathroom had a hole in the ceiling. My bathroom mirror had water spots on it from not being cleaned. Our feet was dirty after just a few mins of walking around without shoes on. When we was ready for bed the throw pillow that was on our bed looked like it had been on the nasty floor. That pillow was laying on top of my husbands pillow and the nasty stuff that was on it rubbed onto my husbands bed pillow. That morning as I was making our bed I found a fake fingernail on the floor. It just was not up to our standard of cleanliness. If the people cleaning this nice home would take some pride in their work it would have been nice. Sorry I had to deliver this bad review, but we paid a lot of money to have to clean it before we could use it. Of all the words available, the only one I can come up with is WOW! I’m terribly sorry to hear that you arrived to find our home in the condition you’ve described...had you contacted me immediately I would have had our cleaning company onsite to address any of your concerns immediately. The beauty of VRBO is the direct contact renters have with the owners, letting me know upon your arrival would have given me the ability to make everything right. Again, so sorry to hear this, this home is not an investment, it’s our families second home and we take pride in keeping it in pristine condition. Our stay at A Bay to Remember was very comfortable! The house made us feel as though we were in a tree house. The teenagers loved hanging out on the upper deck at night and listening to the birds, wind and the waves from the bay. The Island reminds of Old Florida and we all plan on returning someday! The house is laid out very nice and was exactly what we needed for our Thanksgiving getaway with our 2 boys and my mom. There is a second "living room" on the lower level, so the kids could hang out down there while the adults were in the main living area. The kitchen was great and had almost anything we could need to make Thanksgiving dinner! The owner called and spoke to me before our trip, giving us some tips for that side of the island - having been to SGI many times, I've only ever stayed on the beach side and never in Plantation. The short walk over to the beach was easy, and very pretty. The "Cut" at the end of the island was really cool - something you can only access from within Plantation. My boys enjoyed the bike paths. One thing to note on the bay side - the bugs are AWFUL! Although the house has a lovely view and great porches, we could not enjoy them because of the bugs - even in the screened-in pool area. Also, although on VRBO, this house is managed through one of the Island management properties, and you have to deal with them for processing the reservation and then physically go to their office for check-in. There are some minor maintenance issues, and the showers are particularly small and awkward. But overall, I would highly recommend this house for your family getaway. Thanks so much for your very kind words, I’m so happy you and your family enjoyed our home! In my opinion, staying within the Plantation is the only place to stay while visiting SGI...Our family makes lasting memories every time we visit and I’m so glad your family did as well, thanks again! A Bay to Remember Truly is! Great Trip! A Bay to Remember, really is one to remember! Our trip was a last minute decision and we are glad we did it. Chris, the owner, made it very easy to make the arrangements and was wonderful to work with. In the past we typically stayed on the Gulf/Beach side but after staying on the Bay side, we know why people love it so much. It was so peaceful and private. The view of the Bay, from the multiple wrap around decks, was amazing. The area around the house was full of wildlife and allowed us the chance to bird watch, seeing everything from Herons to Hummingbirds! We were able to experience Nature in a well-stocked Bay front home complete with a heated screened in pool! The plantation has miles of nice paved bike/walking trails. Scooters and bike available for rent at multiple locations. All types of fishing: ocean, river, chartered, fly, etc. Bird watching and eco-tours also available. Summer rates apply for spring break, spring rates Thanksgiving, and fall rates Christmas & New Years. Minimum 7 night stay during summer. 1, 2, or 3 week rentals are available for 10% off for seniors (60+, id required), active or retired military (I.D. req.) or for repeat renters. Offers cannot be combined. Oct, Nov, Dec, Jan, Feb, and Mar are available as monthly rentals (28 days).